This quilt is a visual interpretation of a philosophical concept. "Checks and Balances" is a term most of us first heard in our high school civics classes, an idea to which we aspire in government and in the world around us, and often fall short. Perhaps the best way to achieve balance is to look within or possibly create it in our art. 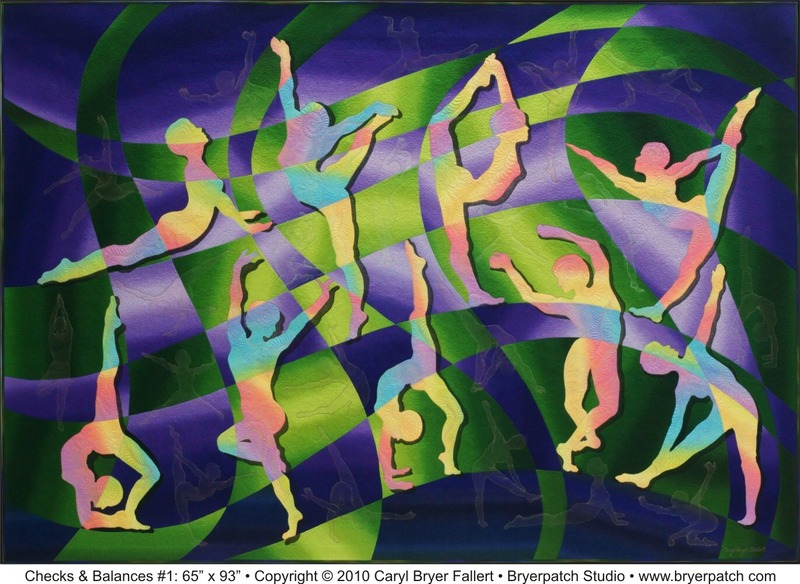 Several years ago, when I first moved to my Paducah Kentucky studio, I attended a performance of yoga dance by Sarah Brumgart. I was enthralled by her artistry, and having just begun classes in yoga and pilates myself, I was astounded by the strength, flexibility, and balance she had achieved through a lifetime of gymnastics, dance and yoga. 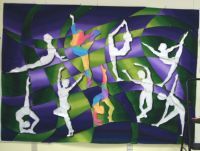 After four years of regular practice, I have found additional strength, flexibility, and balance myself, although I only aspire to some of the positions depicted in this quilt. My whole life I have been enamored with dance, although I didn't learn how to dance until after my 60th birthday. I always imagined it would feel like flying, a recurring theme in my quilts. It is also the ultimate collaborative art, involving visual, musical and kinetic art in a single performance. Through weekly ballroom lessons I have discovered the joy of dancing, and I'm happy every moment I am dancing. My interest in physical movement has given rise to an ongoing series of works that include the human form. 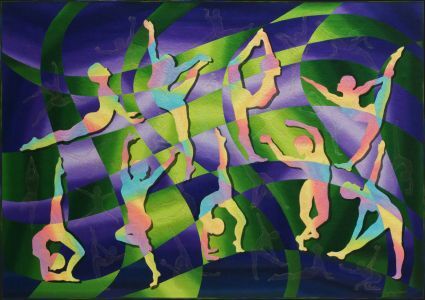 In this piece the dancers are abstract and their colors change as the lines forming the green and purple checks in the background flow through their bodies. 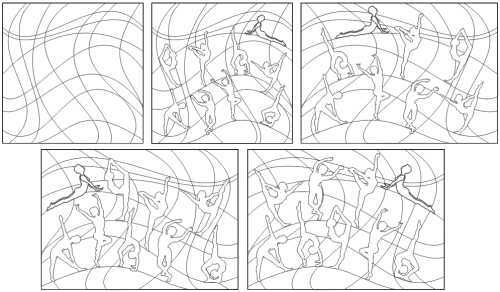 This creates the illusion that the dancers are translucent. Shadows were drawn into the background fabrics so the dancers seem to float in front of the checks. 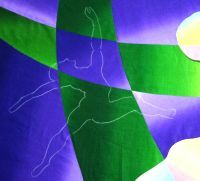 Smaller dancers are quilted into the background in contrasting thread. 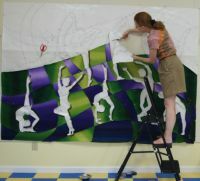 I began the design for this quilt by getting as many pictures as I could find of people doing yoga or pilates poses. I chose eighteen poses and drew silhouettes of the bodies. I knew that I would not be using all of them, but I wanted a variety of drawings to play with while developing my composition. All of the line drawings were scanned into the computer and converted to vector shapes in Corel Draw. I tried many different arrangements of the figures. Eventually I made a checker board from non-parallel curving lines and moved the figures around in the checks until I had an arrangement I liked. Once I had an arrangement I liked, I played with color until I had a clear idea of the colors I wanted to use in the quilt. I still make color decisions while I am piecing the quilt, but having a general map of where the colors and values will fall is important to me. 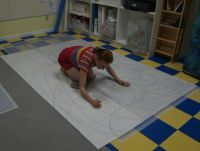 To make a full size pattern for piecing, I printed the line drawing on clear acetate and projected the image onto my design wall with an overhead projector. 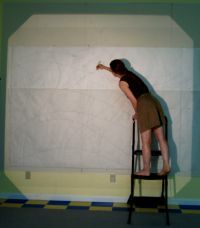 The projected design was drawn with pencil on freezer paper that was 98" wide by 68" high. The drawing then went on the floor of my studio, where I spent a couple of days refining it, smoothing out the curves, drawing the features on the figures, and making registration marks across all of the seamlines so I can get the pieces lined up again after they have been cut apart. 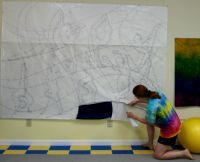 When the drawing was finished I hung it on the wall, shiny-side-out, because the fabric is attached to the shiny side. I began cutting out the pieces of the drawing, one at a time and using them as templates for cutting my fabric. 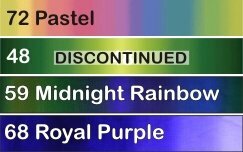 I cut all of the background templates (green and purple checks) first, and then pinned them back on the wall with the freezer paper still attached. The figures were cut from fabrics that contracted with the background checks. 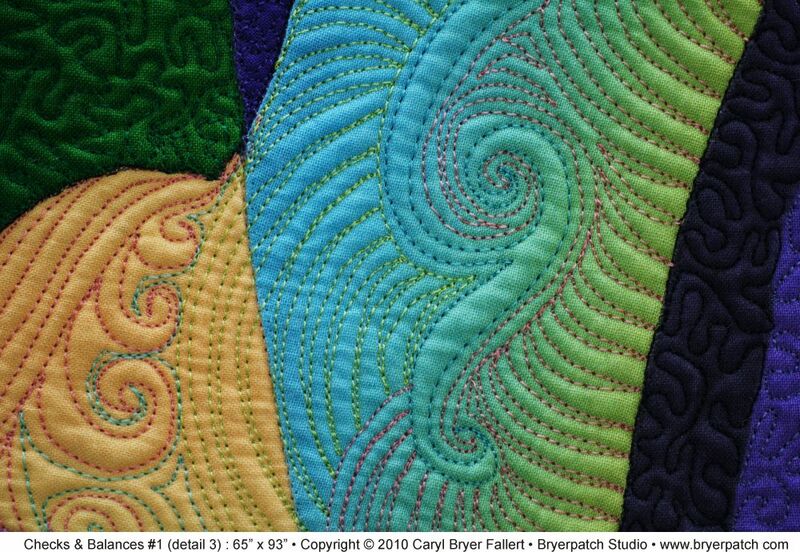 All of the fabrics used in this quilt are from my "Gradations" collection, which I design for Benartex, and as of March 2013, three of them were still available through our Bryerpatch Studio Internet Store. To piece the curved seams I use a method called "applipiecing ®", a fast, easy, and accurate method I developed in 1989 to assemble my complex organic designs. We have complete instructions for this method available through our Bryerpatch Studio Internet Store. When the pieced top was finished I photographed it, scanned the photo into Corel Draw, and designed the layout of smaller quilted figures in the background. I made a couple of copier paper sized quilt sandwiches and practiced quilting a couple of the figures before I marked the quilt top. The small figures were printed on acetate, projected onto the quilt top, and drawn with white charcoal pencil. The top was then layered with batting and a backing fabric from my "Multi-Tye-Dye" collection for Benartex. 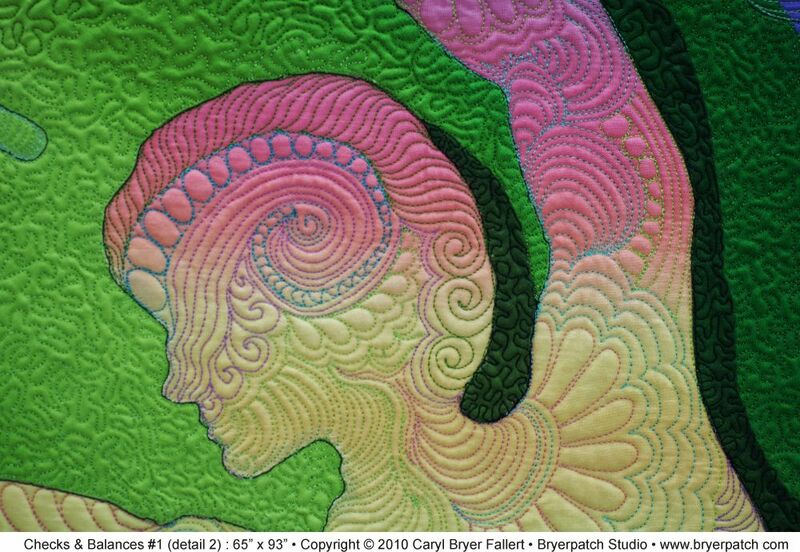 I began by quilting the small figures in the background with contrasting thread. 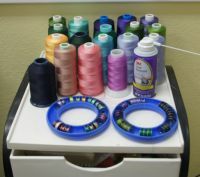 On the day I was ready to decide how to quilt the larger figures, two movies arrived from Netflix, and both of them were about Cirque de Soleil. The performers are clothed in costumes that hide their identity and are often more plant-like or animal-like than human. 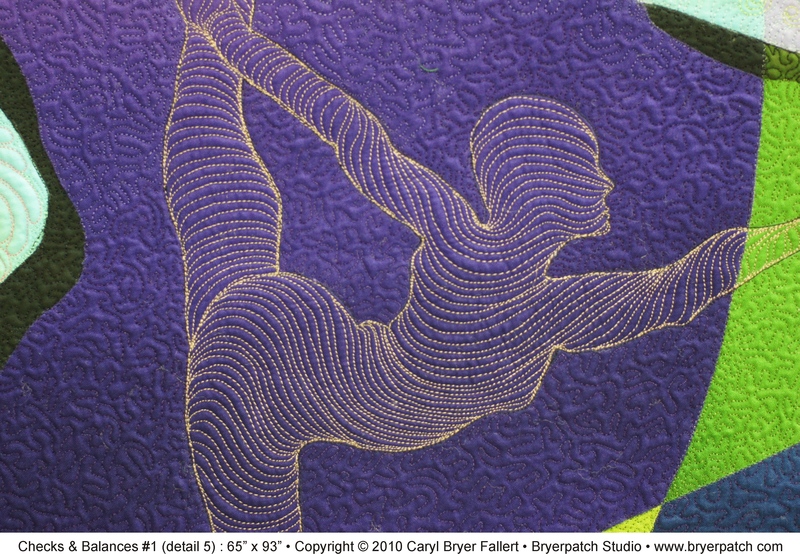 The fantasy quilting of the figures, in many different colors of thread, was inspired by this meshing of fabric art and movement. The background of purple and green checks was quilted last, in a small meander pattern with thread matching the background, which graduates from light to dark. This is a smaller more uniform pattern of stitching than is found in many of my quilts, and it took almost two weeks to complete. A looser, more decorative stitch pattern would probably have hidden the small dancers. The result of twelve or more hours a day of quilting is often a stiff or stooped back and a sore neck. To overcome the ill effects of my quilting marathon, I used an exercise ball to reverse the direction of my spine and stretch the muscles in the front of my shoulders several times each day. The quilt was completed on Friday, September 3, 2010 at 11:15 am.